Industrial crane scales are used for weighing a hanging load. When industrial needs are concerned, very heavy, sometimes bulky loads are involved which are not always easy to place on the scales for determining the exact weight. Crane scales represented by a variety of models, with different range and weighing capacity, offer a solution for the problem how to weigh a nonstandard oversized load under industrial conditions. PCE digital crane scales are some of the toughest crane scales for sale today. Our industrial crane scales have big, easy-to-read displays. Our smallest crane scales have a weight range up to 20 kg and a bright display which can be clearly read from a relatively far distance from the crane scales. The PCE-DDM series crane scales have a weight range up to 50 t. Some re-sold crane scales models from other manufacturers reach a max. weighing capacity of 200 t. They are operated by rechargeable batteries, which provides convenient operation. Based on their technical features and specifications, the application field of crane scales is wide: heavy industry, construction, transport and aerospace, various types of mills and factories, marine etc. – in other words, anywhere where the load cannot be lifted up and weighed by the person. When there is a necessity to get an immediate indication of the load and to measure tensile forces, the load cells or load links, both belonging to the load indicators, can be used. These types of crane scales are especially good for load monitoring, are lightweight, but robust and due to the electronics are likely to provide precise result in the fields of force measurement. 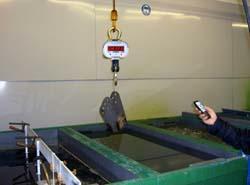 Some crane scales can be operated via a remote control. Thanks to the infrared remote control, on select models, the crane scales can be used under various conditions. The summing of crane scales allows for adding partial masses, so as to obtain the total mass upon completion. The robust construction of the crane scales make them ideal for industrial use. PCE crane scales have a safety factor of 4. Safety factor is how much stronger the system is than it usually needs to be for an intended load. Maximum safety overload protection is 400% in all the weight ranges. Some models of crane scales have an overload safety factor of 5 and an overload protection of 500%..
Safety is one of the most important issues because crane scales are usually in operation where there are a lot of other equipment and machines and any kind of accidents and collisions must be avoided. It is necessary to make sure that the crane scale is installed correctly in accordance with the rules and requirements of the manufacturer and is operated professionally by someone familiar with using crane scales. If this is provided, then the crane scales are likely to present very accurate precise results, good readability of the values and sufficient level of protection during overhead weighing or when it comes to overweight.. Most crane scales, not depending on their capacity and range, are verifiable and calibratable and are manufactured in compliance with the regulations, in particular the International Organization of Legal Metrology (OIML), which pays special attention to measurements, measurement values, units and accurate results. Therefore, the crane scales from PCE Instruments have got a sufficient readability, value and accuracy. Crane scales presented by PCE Instruments are all certified and belong to Class II devices. Here you can see a Force unit converter. It enables you to transfer the data (unit) you have got by the crane scales into units like kgf, pound, N,... In addition you find some more information about crane scales as: Videos, Safety instructions and safe use of the instruments themselves. In each product description user manuals, test protocols and drawings are available. If you have any questions about crane scales, please contact us at or Phone: +44 (0) 2380 987 035 for PCE Instruments UK, or or Phone: +1 (561) 320-9162 for PCE Americas Inc.
PCE-CS 300 is a digital, battery-powered Crane Scale for indoor use. The rugged design of the Crane Scale accommodates applications in rough industrial conditions as well as in fields such as food and hygiene. PCE-CS 1000N is a digital, electronic, battery-powered crane scale that displays measurement values in kilograms (kg), pounds (lbs) and freely adjustable units. 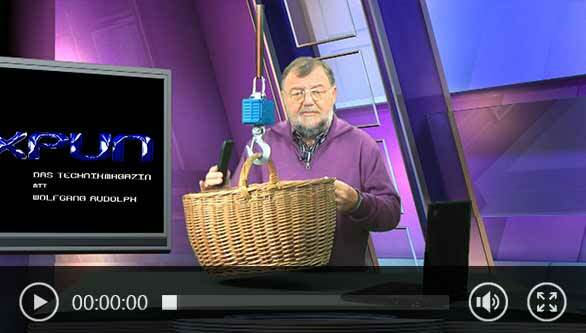 The scale comes factory calibrated and includes a hook, shackle and remote control. For an additional fee, the scale can be calibrated according to ISO standards. PCE-CS 1000N-ICA is a digital, electronic, battery-powered crane scale that displays measurement values in kilograms (kg), pounds (lbs) and freely adjustable units. The scale includes a hook / shackle, remote control and ISO calibration certificate. PCE-CS 3000N is a digital rechargeable battery-powered heavy-duty crane scale that displays measurement values in kilograms (kg) or pounds (lbs). The crane scale comes factory calibrated and includes a hook, shackle and remote control. For an additional fee, the scale can be calibrated according to ISO standards. PCE-CS 3000N-ICA is a digital, rechargeable battery-powered, heavy-duty crane scale that displays measurement values in kilograms (kg) or pounds (lbs). The crane scale includes a hook, shackle, remote control and ISO calibration certificate. PCE-CS 5000N is a digital battery-powered Crane Scale that displays measurement values in kilograms (kg) or pounds (lbs). The Crane Scale comes factory calibrated and includes a hook, shackle and remote control. For an additional fee, the scale can be calibrated according to ISO standards. PCE-CS 5000N-ICA is a digital battery-powered Crane Scale that displays measurement values in kilograms (kg) or pounds (lbs). The Crane Scale includes a hook, shackle, remote control and ISO calibration certificate. The PCE-DDM 3WI Crane Scale is the ideal tool for weighing big loads and for measuring strong tensile forces. The PCE-DDM 3WI Crane Scale is delivered in a protective carrying case and includes two shackles made of heavy-duty aluminum. The instrument is manufacturer calibrated, but can be certified to ISO standards for an additional fee. PCE-DDM 5WI is a rugged crane scale designed to weigh large hanging loads. PCE-DDM 5WI is also a durable digital dynamometer specially crafted to measure strong tensile forces. This high-capacity device is delivered in a protective carrying case and includes two shackles made of heavy-duty aluminum. The PCE-PS 300MLS Crane Scale has a wide weighing range up to 300 kg / 661 lbs and can be integrated in your present bariatric system. The PCE-PS 300MLS Crane Scales have an easy-to-use display by means of two keys to turn the scale on/off, zero set, or tare. The PCE-PS 300MLS Crane Scales are powered by a power component or an internal battery, both of which are included in the delivery. The PCE-DDM 3 Crane Scale is the ideal tool for weighing big loads and for measuring strong tensile forces. The PCE-DDM 3 Crane Scale is delivered in a protective carrying case and includes two shackles made of heavy-duty aluminum. The instrument is manufacturer calibrated, but can be certified to ISO standards for an additional fee. The PCE-DDM 5 Crane Scale is the ideal tool for weighing big loads and for measuring strong tensile forces. The PCE-DDM 5 Crane Scale is delivered in a protective carrying case and includes two shackles made of heavy-duty aluminum. The instrument is manufacturer calibrated, but can be certified to ISO standards for an additional fee. The PCE-DDM 10WI Crane Scale is the ideal tool for weighing big loads and for measuring strong tensile forces. The PCE-DDM 10WI Crane Scale is delivered in a protective carrying case and includes two shackles made of heavy-duty aluminum. The instrument is manufacturer calibrated, but can be certified to ISO standards for an additional fee. Which crane scales / hanging scales are the best suited for your application? As a customer, you can always call the PCE Instruments technical consulting hotline: +44 (0) 2380 987 035 for PCE Instruments UK or +1 (561) 320-9162 for PCE Americas Inc. The colleagues will ask you specific questions about your application and suggest the best crane scales for the solution of your measuring tasks. Below you will also find some tips that should be taken into account when selecting or buying crane scales / hanging scales. The maximum weighing range is probably the first and most important question which has to be answered before buying crane scales / hanging scales. This is one of the parameters by which it is possible to determine immediately whether the selected measuring system is suitable for the particular application. The weighing range for crane scales / hanging scales should be bigger than the estimated maximum load. It is ideal, of course, if the maximum load can be estimated up to a few kilograms. A few hundred, could lead to the excess of the weighing range. If, for example, there is a weighing task for an object that weighs about 560kg, a 600kg crane scale can, of course, suffice. Concerning the crane scales’ durability and eventual tolerances, it would be more appropriate to choose a crane scale up to 1000kg. Thus, the bigger the difference between the mass and maximum load is, the less the crane scales will be loaded, which increases the durability. The resolution and readability of crane scales is in most cases dependent on the weighing range. For a weighing range of 1500 kg, a typical value for a resolution would be 0.5 kg. Usually, the resolution can be calculated on the basis of the crane scales’ weighing range. This is mostly a three-thousandth of the crane scales’ weighing range. 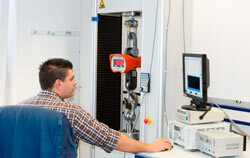 However, PCE Instruments can offer an even better resolution for certain crane scales / hanging scales. Should the usual resolution steps not be enough for you, you are welcome to contact our technicians. What is the difference between verification and calibration? In both cases, a setpoint is compared to an actual value. However, whereas verification can only be carried out by the verification authority, the calibration of your crane scales can also be performed by laboratories and other institutions. A verified system, for example, cannot be easily adjusted, since these options are blocked by the verification and the verification seal for the purpose of consumer protection. Verification of crane scales is required, for example, for price calculation on the basis of a weight. Calibration of crane scales, on the other hand, is necessary for certification in compliance with ISO 9001. A detailed explanation can be found on our Youtube channel under the name "What is calibration and what differences are there? | PCE Instruments ". For most applications a crane scale does not need more than the integrated display. However, it may happen that you have a load that obscures the visibility or needs to be lifted up. Because of that, even though you determine a value with your crane scales, you will never know it. That is why, for some weighing devices an additional remote indicator can be used. This is available, for example, in some models of linkloads or in the PCE-MCWNT crane scales. Via some remote indicators it is also possible to save the weights determined by the crane scales or transfer them directly from the crane scales to a computer. This would give you the opportunity to get an electronic documentation. If you need this function, make sure the systems are equipped with an infrared or radio interface. These can then be used for the wireless transmission of your crane scales’ weighing data. In principle, maintenance is required for each measuring system. However, the biggest costs for crane scales are calibration, which is recommended annually, as well as verification which has to be renewed every two to three years. The costs are then dependent on the weighing range and accuracy of the crane scales. The calibration of your crane scales, for example, could be specified in your ISO quality manual. Adjustments to calibrations or consumables such as batteries or battery packs for your crane scales must also be considered. A point to be considered. Of course, you cannot easily assess the performance of a company from the outside. Finally, you have to ask yourself whether you can still receive support or order spare parts for your crane scales in a few years. Call PCE Instruments, speak to one of the technicians and the colleagues from the order department, check yourself the quality of the consultation and rely upon the worldwide corporate network of PCE Instruments (since 1999)..
Below, you can see two common practical applications of crane scales in industry. At the crane scales link, you will be able to see other images of the industrial use of crane scales. You can also get ISO calibration certificates for our crane scales. Here are some further details of our crane scales with a weight range from 100 kg up to 200,000 kg. These crane scales are often recommended in the loading ramp area, where the weight of the load can be read directly. However, these crane scales are also commonly used in the production field. For instance; to elevate a drum, and to read the weight to see the results directly at the production site. The images above show crane scales during application. On the left you can take a look at the PCE-CS HD series crane scales being used in a galvanized installation. As you can see the crane scales are hard to reach in this particular situation, but the infrared remote control allows a comfortable and safe operation from a distance from the crane scales. The picture on the right shows the PCE-CS 1000 series crane scales during operation. Due to its large illuminated LED display, the values measured by the crane scales can be read even when standing far away. This improves the safety at work when weighing out heavy loads, using crane scales. How accurate is your test equipment? Crane scales need to be verified when they are used to determine the price of a product according to its weight. Verification certificate for crane scales be performed by the local authorized specialist, or by associates of PCE Instruments. Once an official crane scales verification is done, the crane scales cannot be recalibrated using an external calibration weight. The first verification of your crane scales is valid for two years, but every other verification is valid for one year and must be done annually. We recommend the companies that wish to make an internal quality control to their crane scales to recalibrate them annually or to obtain an ISO calibration certificate. If you wish to get more information regarding the verification of crane scales or if you need your crane scales to be verified, contact your local authorized calibration verification specialist. If you have any questions, you can get a consultation regarding crane scales from one of our engineers or technicians. In order to meet the ISO 9000 standard, a crane scales’ certificate consists of a laboratory calibration and a certificate with the testing results of the crane scales. In the certificate there will be the name of the company or the details of the customer. If you want to use your crane scales under tough industrial conditions, you should make sure that the crane scales’ material is adequate. In some cases it is more important that the crane scales’ material is resilient, in other cases a low weight is much more important. Some of PCE Instruments’ crane scales are (partly) made of stainless steel, other crane scales are made of ABS plastic, high-strength composite plastic or (cast) aluminium. In addition to the weighing function, some of PCE Instruments’ crane scales also have some other useful functions like an Auto Power Off function, a Peak Hold function, a conversion function, an animal weighing function, a summing function, a zero function, a tare function, etc.